1 in 5. I guess my grandfather was one of the lucky 4. Very cool , i'm really getting into submarines. The technology of the US fleet boats in WWII is what astonishes me the most, particularly that of the TDC. A truly remarkable technological feat. These things were shoe-horned into fleet boats even before Pearl was bombed; the TDC MkI was designed, built, and installed during the mid 1930's! 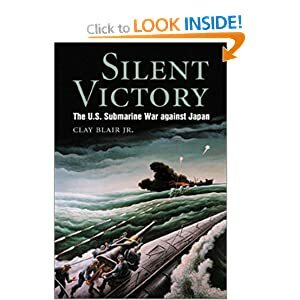 I think the sub that survived 48 hours of depth-charge attack was the USS Seal (I'm reading a book right now that details the experience of one of the crewmen who served on that patrol). SO intense. They had one torpedo in the aft tubes about 1/2 way in before the pressure lodged it in the tube. One of the crewmen somehow managed to shove it in on sheer brute force before the pressure on the outer door could punch into the compartment during the initial dive. They had charged a convoy that was hugging the coast off on Honshu, fired forward tubes, then dove deep to go under the convoy line to use their aft tubes for a second salvo. When they came up, they found out that there were 5-7 destroyers between the convoy and the shoreline, and so began the "fun". Going back through the thread, it seems like there are multiple subs who had similar experiences! Next up - "Shinano! - The Sinking of Japan's Secret Supership" by Captain Joseph F. Enright, USN. Half-Price Books, $9.48 hardcover. Details one of the patrols of the USS Archer-Fish, who holds the single-patrol record for tonnage at 72,000 - all from one ship. Apparently the Shinano was laid down as the third in the Yamato/Mushashi class super-battleships but they converted it to a flat-top in the middle of the war. It was sunk hugging the Japanese coast before it was fully fitted out and ready for service. Hardly sporting. The Best Book on the subject ? I have found this to be the most complete work on the Pacific Submarine campagin. I read this and was totally hooked on the subject and the period. As a Brit I can't get my head around being a U-boat skipper. My Farther was in the Royal Navy on the Carrier HMS Furious so I guess its Allies only for me. There are quite a few titles about the Silent Service, but this is the way to go for a first read on the campaign. The data in the back is pretty awesome too! Having served on a diesel electric boat not unlike the ones used in silent hunter 4 (look up british o boats though i served on, an aussie one) i can claim an experience little in modern day have. the experience of having a torpedo hit about 10 feet from where i was working. luckily for me it was dummy torp and it hit the dome protecting the sonar. scary as hell as you hear it approach then BANG... didn't do much good for my nerves. I have a lot of respect for the men who served in subs in any of the theatres on any side. it was a difficult and hazerdous as survival wasn't good for a submarine caught by the enemy. Hooch, you served on an O-Class? Nice! I have been playing submarine sims since Silent Hunter I. Am now on TMO2 and GWX3. Enjoying them immensely! But just today I came upon this thread and I absolutely have to applaud the initial presentation by Ducimus, and the very entertaining followup by the numerous other posters. The modding work that has been performed by you gentlemen (you know who you are) and the intensity that has been displayed by all in these various postings and threads is remarkable. Today I gained a great respect for the men of the Silent Service, and those of you who carry on the spirit on the internet! "Thank you for the Memories" - with apologies to Bob Hope. He asked if I'd give him extra marks for his next essay, sadly I wasn't able to but he did get my thanks, & I posted some mod files to him! I have the insane urge to make an amateur film. If I lived anywhere near a sub, I would go through all the channels and get that done. I love producing. Last edited by Anthony W.; 05-05-2011 at 10:57 AM.